Some Slotmanias ago I picked up a box with around two doz. 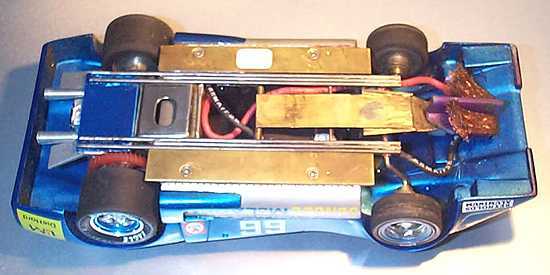 of 1/24 chassis made of brass and piano wire. It was supposed that they might be Riggen frames. On the first glance they were nothing special and I bought them to build up some pretty fast race cars for our Superslot class. 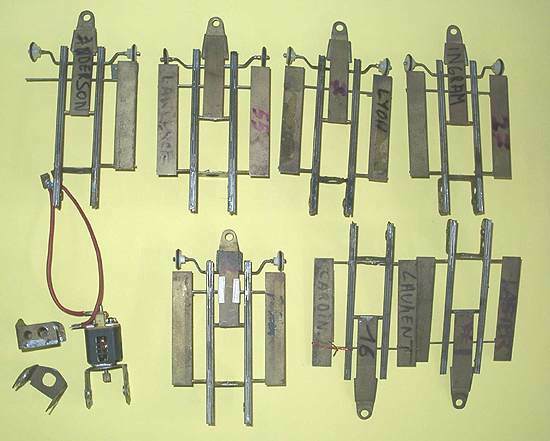 The main frame consist of a brass inline bracket (with bronze bearings) soldered to two triple piano wire rails, both middle rails are shorter to generate a gap for the bracket. One piano wire at the front and two short brass tubes at the back are crossing the triple rails (right handed) to hold the two brass pans (app. 73 x 12.7 x 0.8mm or 2 7/8" x 1/2" x 1/32") in place. The swingarm is made from a stamped brass sheet pick-up retainer to take the jet flag, a 2 1/4" x 1/2" x 1/32" swingarm and a 3/32" tube that is connected by two (right hand) bent 1/16" piano wires to the rail frame. 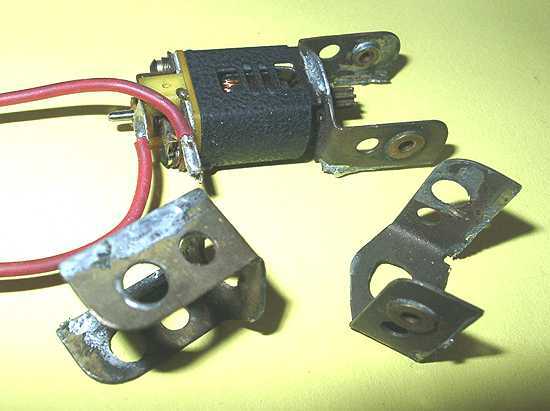 The tiny (9/16") front wheels, plastic disk with o-ring, are kept in place by brass tube spacers on a 1/16" piano wire in shape of a bicycle bar soldered two the main rails. The swingarm travel is limited by a bendable 1/16" brass or 1/32" piano wire stopping on the front axle. Body attachment is with pins and tubes on the pans. Only one chassis has a black C-can motor with yellow endbell and balanced arm, the identification label isn´t readable anymore. Having a closer look there are some names and numbers written on the undersides. It was possible to decipher: #37 INGRAM, #55 LAWRENCE, #16 CAROIN LAURENT; #18 (or #81) BERNADINO, #25 303 ..., #66 ..., #42 P. STOX (STOT, SHOT), # ... ANDERSON, #7 LYON, # 1 207 Laster. Does someone know which years these chassis were raced, which manufacturer built them, which bodies are contemporary ... ? "Thomas, These chassis were built in the late seventies by REH from old parts, and were supposed to be used as Vintage Racing Cars by Van Rossem at the Toulouse World Championships in France. Somehow, it never happened, and these are the leftovers. REH used old brackets and nose pieces from leftover U-Go parts from the late sixties."